In a quick survey of what other publications are saying about AFTRA's tentative deal with the producers, some important issues and questions were raised. * In the Los Angeles Times, reporters Richard Verrier and Claudia Eller write, "Although AFTRA's accord falls short of satisfying some of SAG's key demands, it could still help the larger union craft a deal that would avoid a strike this summer." What key demands weren't satisfied? The AP indicates, for one, product placement. SAG had stated before its negotiations began April 15 that it wanted some say and some revenue from PP, which studios and advertisers are using more frequently in the age of DVRs and video-on-demand. * The L.A. Times also had an editorial praising the deal but fretted over the possibility that there could be a strike (remote, but still a possibility): "...A chill is already descending on the industry. Producers have been reluctant to start projects that could be interrupted by a strike." Will there be a strike? 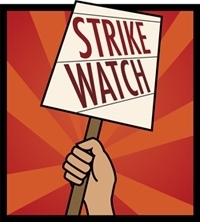 Two sources (who tilt toward the pro-AFTRA, not-so-pro-SAG side of the equation) downplayed the idea to Strike Watch. One source who has consulted for several of the entertainment unions said negotiations would continue past the June 30 deadline into July but there would not be a strike, something Variety hinted at in its report: "Despite the tough talk, SAG hasn't taken the step of scheduling a strike authorization vote, which would require 75% approval among those voting -- and would, of course, ignite passions on both sides." * Nikki "I've Learned Therefore I Am" Finke, in a shockingly self-referential passage, declared this bit of intelligence so last month and lambasted Variety for being so totally lame and out of it, I fear she won't ever let Dave McNary sit next to her in the cafeteria again. * Meanwhile, attorney/industry blogger Jonathan Handel told The Hollywood Reporter that because studios aren't greenlighting any films until SAG strikes a deal, a de facto lockout could be in place after June 30. What will a de facto lockout/strike mean for actors? The guess of Strike Watch, and it's only a guess, is that it will hurt actors in film but not in TV. Because the AFTRA deal will probably be in place by then, SAG won't want to shut down production while AFTRA-covered shows are up and running. The guild, however, would have no choice but to wait until their contract is done before movie work continues. However, Handel has now debunked that theory. (Yes, Strike Watch is never above mining the same sources as other publications--some call it thievery, we [like the French] call it "homage.") He believes the studios may lock out SAG from TV as well: "They wouldn't want to give SAG that kind of leverage, where TV shows are up and running and then they could walk out on strike." P.S. 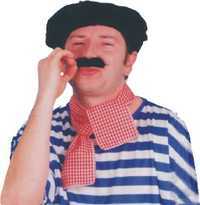 The picture is of a supposed French man I got on the Web. It is not Jonathan Handel. I suppose I could have looked harder for a Maurice Chevalier--as this guy is as French as Chef Boyardee is Italian--but, alas, deadlines loom.